Marj's Note: A couple of years ago, Mike traveled to Bali, just one of the thousands of islands that comprise the sprawling archipelago of Indonesia. 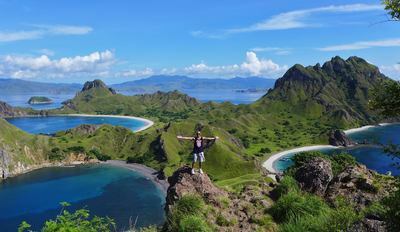 Recently, he returned to explore some of the less-visited isles in the area called East Nusa Tenggara, east of Bali, a more typical travel destination . He posted on Facebook as he traveled and what follows are a few excerpts and photos which capture the essence of his trip. I flew out of a one-gate airport today, one of those relaxed island experiences that took all of 3 minutes, from entering the terminal, checking in, receiving a boarding pass, checking a bag, walking through security 10 feet away and then watching my plane land outside the large windows of the airport's only gate. I love flying short, domestic hops when overseas, because they not only transport you deeper into the journey, but they help you recreate that arrival excitement all over again. 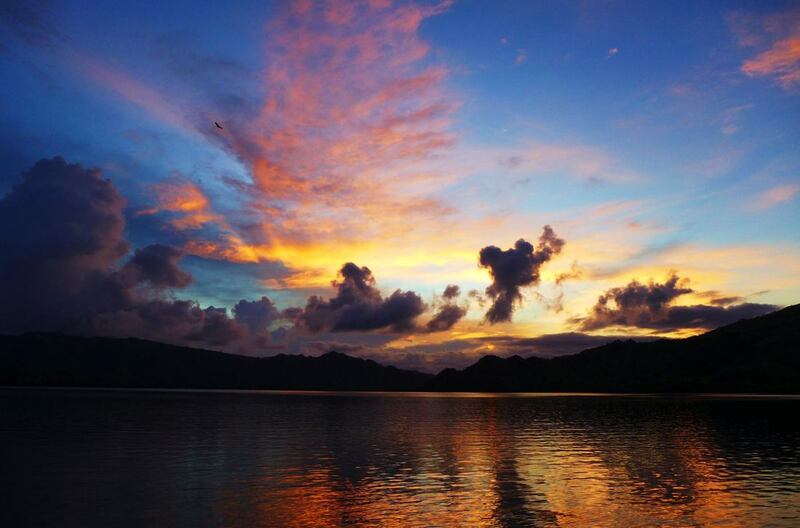 The town of Labuan Bajo on the western coast of Flores offers the familiar Indonesian rhythms, but something entirely new. Instead of gazing at a towering volcano, I'm sitting at a bar overlooking the harbor and islands rising from the sea just beyond. There will be trips to book, boats to ride, dragons to dodge, but flying low and slow today reminded me how Indonesia has revealed itself to be so easy and breezy to navigate. ​When I looked at my little island on a map at home, I was intimidated, because of its global isolation and exotic unknowns. But I was cursed two years ago when I saw my first picture (in a magazine) of Mt. Kelimutu, somewhere I had never even known had existed. I instantly knew I had to visit. Someday. It is still hard to find on a map (some show a different island name), but I am here. I think the key is just not giving up when your trip looks too difficult or complicated or out of reach. There's always a way. 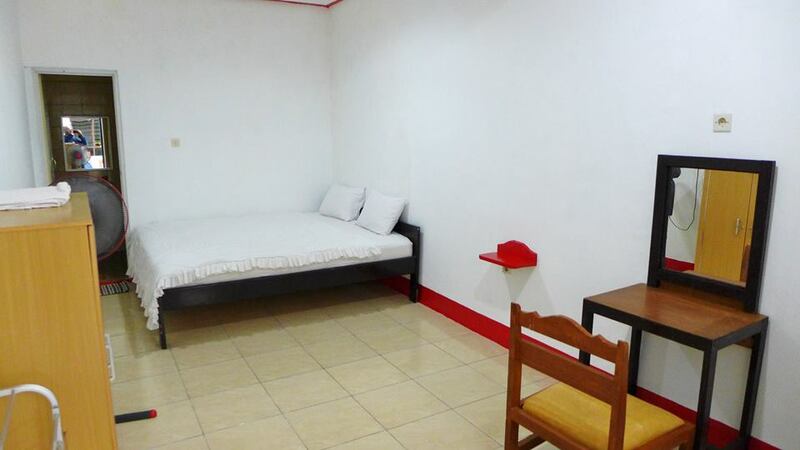 ​After landing at Komodo International Airport, I greeted my guy, who held a cardboard "Mike Stratton" sign at arrivals, and climbed aboard his scooter for a sun-splashed 15-minute ride to my hotel. Traveling is the epitome of human propulsion, that continual push of exhilarating movement across the planet by plane, auto, cycle or sail. And if done properly, that traveling momentum works best on your imagination. The fish is good here. The scenery even better. The locals? The best. I love Asia and keep returning because the skies and clouds look different here, thanks to the vast amounts of warm water and climate. And these typical Asian skies are producing the most dazzling sunsets, and none more so than this. A roiling, malevolent, magnificent sky, peppered with the appearance of the giant fruit bat. 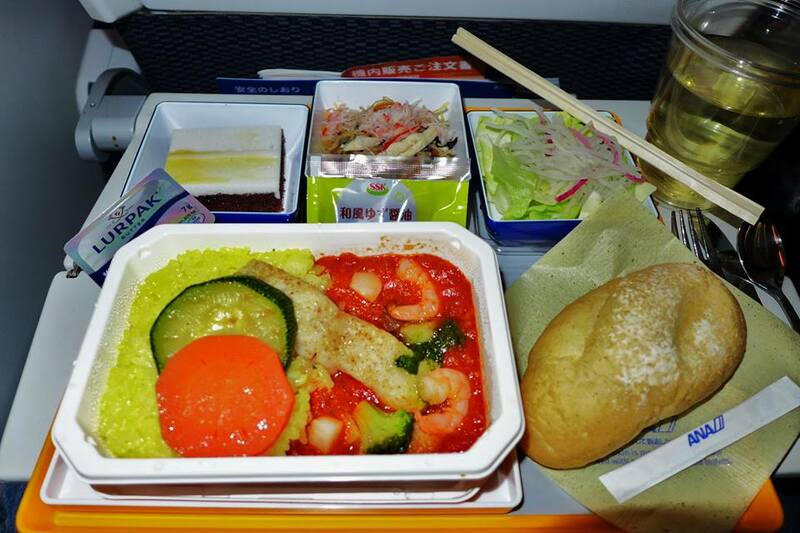 When offered the choice of a seafood meal on an Asian airline, don't be a dummy and choose the chicken. This fish, shrimp and rice dish with a seaweedy crab salad was typically excellent coming from ANA, an airline that is just about the best in the world in everything they do. closely mirrors what you ind beneath a reedy little shack at the beach. Grilled whole fish with mild chili salsa, potatoes and egg with chilies and rice. 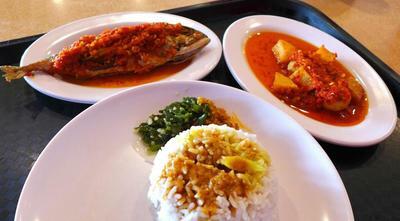 Mix the potato, egg and rice together and then pick at the smoky, spicy fish, with that crunchy skin. Delicious. 4 dollar airport food. 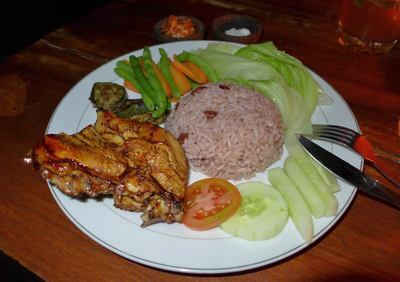 My first meal in Flores, a nice little bit of rice, veggies, mushrooms and chicken, a tasty meal coming in at around 3 dollars. Cheap food tour begins now! I love cheap, delicious food! 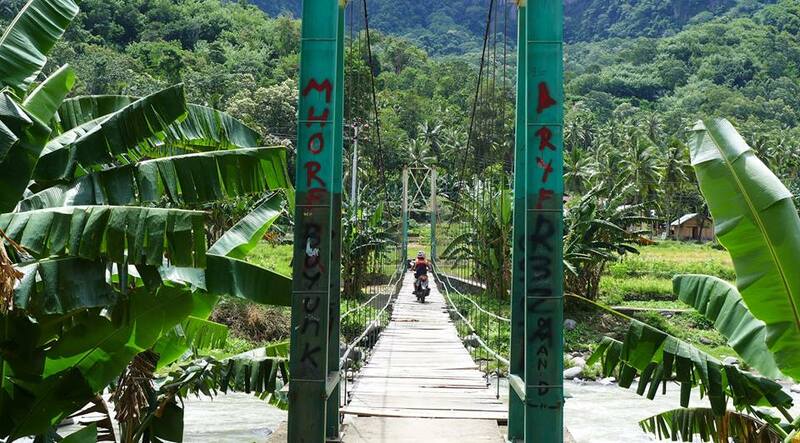 this rickety bridge on my way to my homestay, and it was quite holey. I was kind of surprised the motoscooter guy headed across the boards. Brass ones that guy. The (one) road from Ende to Moni, Indonesia. The peak of Mt. 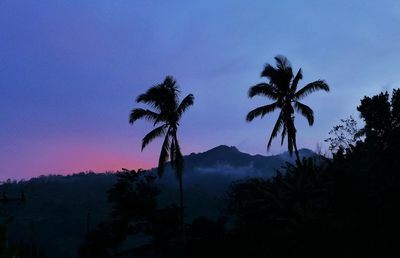 Kelimutu is un-hidden on this clear, soon-to-be-starry night, bisecting the two giant coconut palms as the sun sets early here high in the mountains. The lightning that ricochets off the peaks is as exotic a sight as you can imagine, nearly as surreal as those 3 hidden lakes, up there, in the volcanic air. Moni, Indonesia. 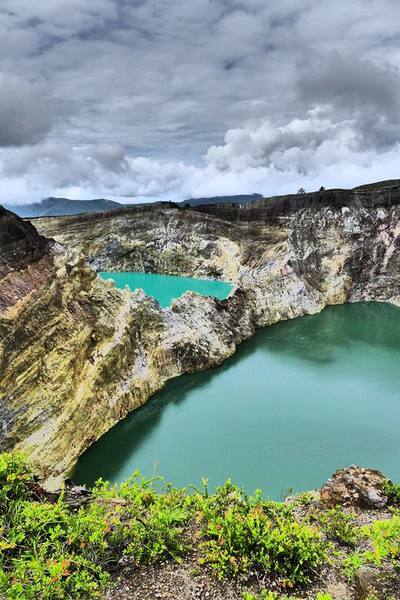 My volcano obsession brought me to Indonesia, where I could climb these final few steps to one of the world's great, hidden perches, where I could overlook one of the world's great, hidden, high and mighty volcanic lakes. Three of them, in fact. Believe me, the anticipation was nearly unbearable. It's been a long way, but we're finally here. 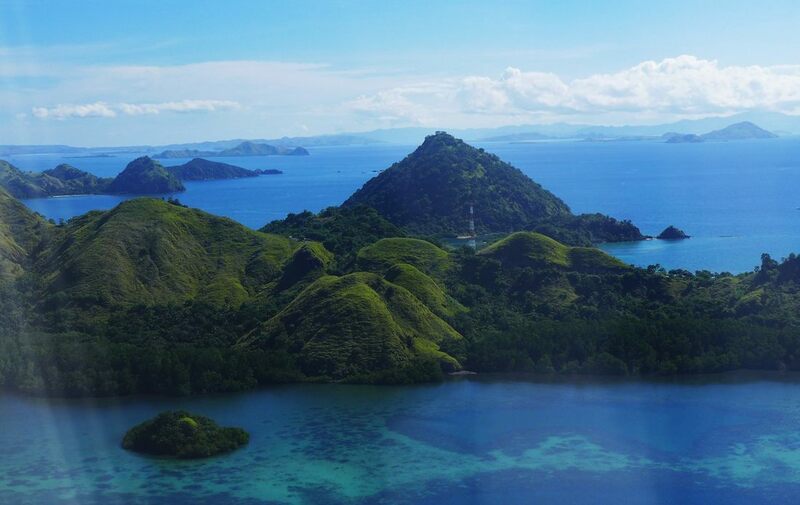 The absolute ends of the Earth on the island of Flores (East Nusa Tenggara), on the eastern end of the Indonesian Archipelago. The spectacular volcano Mt. Kelimutu! 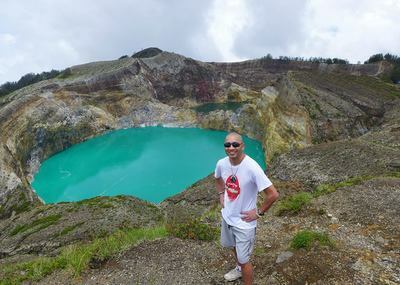 A reverse angle of the lakes of Kelimutu, Tin at the rear and Tap, in the foreground. They give their lakes adorable names. Mike got a ride to the top of Mt. Kelimutu with a local scooter driver. His story continues on a day that threatened rain . . .I rode a mile high into the clouds on the steepest, curviest rainforest mountain road this side of Peru, past rugged villages, waterfalls and green rice terraces clinging to the steep slopes. Halfway up the mountain we encountered a stretch of mist and fog, and I was forlorn. Oh no. But the joy I felt when we penetrated the mountainous muck may have elicited a "whoo hoo" from this passenger. Mt. 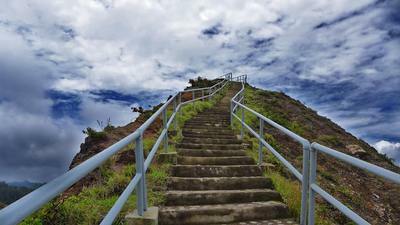 Kelimutu! I wish I could describe the dramatic sight as I first glimpsed the magical, surreal lake in Mt. Kelimutu's caldera, a lake incomparable in its deep, rich coloration. And then another. And another! The famous 3 lakes change color depending on the mineral content and temperature, so each visitor sees a different combo of colors, from turquoise to black to red. The lakes were formed after the volcano blew its top; volcanoes in this region are all too eager to please. The destructive aftermath left malevolent yet gorgeous earthly art, unique and bizarre, an Indonesian fairy tale come to life. My driver/guide told me to take my time. "You have come a long way" he smiled through broken English. I nearly had the summit to myself, but gladly shared my excitement with two other fellow travelers, those who find the reward in taking that leap. I carved out a quiet moment, just me and the shattered old volcano, still active yet so welcoming. The sun cast cloudy shadows over the waters below, and I closed my eyes. "Let it rain," I thought. "Let it pour!" Nothing from the skies above or the earth below could ever ruin such a magical day on this most extraordinary living, breathing space rock.